I’m flabbergasted that this is a person in government, let alone minister in charge of our environmental policies. Can our most influential people in the world best scientists at hand, be so dumbed down? This situation can only be possible if such people have an alternative agenda. We are talking about the possible meltdown of the planets weather systems with all the consequences that come with this. Even in the last decades of the doubt – which is fading fast, acting on the worst case scenario, would be the least that you should do, when confronted with such biblical sized problems. Mr Paterson is suspected of being a global heating sceptic and has called for a reduction in the subsidies given to wind farms and other green energy initiatives such as solar panels, so putting his personal opinions aside, we can only assume he is under the influence of companies connected to the fossil fuel industries. Inaction on the greenhouse effect problem, which has been known since 1824 and confirmed in 1896 is inexcusable in 2013. When was the last time you heard the term, ‘greenhouse effect’ mentioned? Which is the true and easy way to explain the situation? The term ‘climate change’ is used by the mainstream media – a deliberate re-branding of the whole global warming problem to seem far less dangerous than it is. The Amazon forests have been in drought for three years, the Trans-Atlantic conveyor, which connects to the whole global weather systems is weakening and is already affecting harvest yields worldwide. This would cause climate meltdown of biblical proportions. There is nothing more important than the health or survival of the planets Eco-systems which are vital to prevent mass starvation of billions of people, so to see three of the most influential institutions (media, energy and politics) behaving in the such a careless and dangerous way, should make all our blood boil. 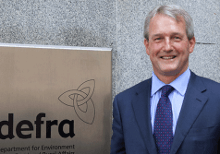 Political denial or sugar coating of the global warming problem as witnessed by Mr Paterson’s party political conference speech should be very quickly be viewed as incompetence at best or corrupt at worse, especially with all the scientific evidence that has been available for well over a century and is ignored. Ignorance is no excuse for any politician, especially for the Secretary of state for the environment. When my son one day asks me why our generation never did anything, I am going to let him read this page to say, “this is the level of leadership we had to work with,” God help us!